Haitham Mattar, chief executive officer of Ras Al Khaimah Tourism and Development Authority (RAKTDA), has been named Leisure and Tourism CEO of the Year at the CEO Middle East Awards. Mattar received the award as a gala dinner that brought together top leaders of the most prominent companies in the region. 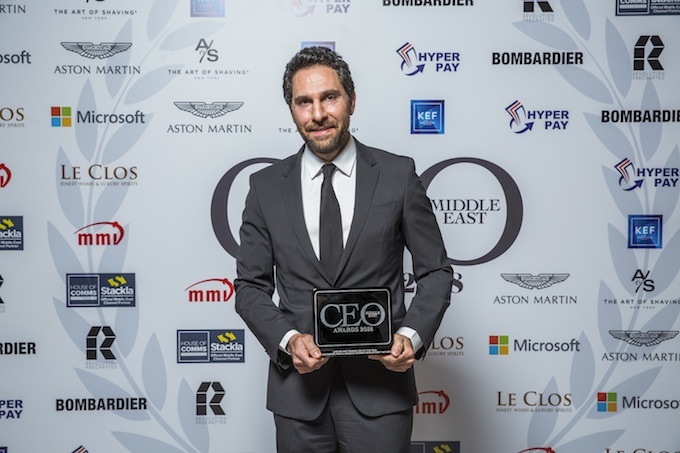 The CEO Middle East Awards recognise and reward the most successful and innovative CEOs in the region who have delivered outstanding results and made a vital contribution of the vibrancy of their organisation across the Middle East. Haitham Mattar was nominated by the judging committee as a result of his outstanding leadership and dedication, paving the way for Ras Al Khaimah to become the fastest emerging tourism destination in the region. Under his leadership, Ras Al Khaimah, recorded a remarkable increase in the number of international arrivals accounting to 14 per cent in the first half of this year, allowing the Emirate to be on track to exceed the original projection of one million visitors by the end of the year. Commenting on behalf of the judging committee, Shayan Shakeel, Editor of CEO Middle East, said: “It’s remarkable what Haitham has brought to Ras Al Khaimah during his time at the RAKTDA. I’ve spent a significant portion of my life in the UAE and RAK had always been a smaller, quieter Emirate. “The past year I’ve visited RAK more times than I had in all the years I’ve lived in the country. The Emirate retains all of the natural charm, calmness and beauty that it is known for, but there’s also so much more to do now. “You can go ziplining, mountain climbing, have lunch on a mountain, stay at the many incredible hotels, enjoy watersports on white sand beaches. There’s even an emerging nightlife scene. Additionally, Ras Al Khaimah achieved a Guinness World Record with Jebel Jais Flight: The World’s Longest Zipline. This gained the Emirate considerable recognition on the local, regional and global stage and propelled the destination into the major leagues of global adventure tourism. Ras Al Khaimah’s tourism industry witnessed a tremendous growth of 8.7 per cent between 2014 and 2017, with a reported 19 per cent increase in the overall number of guests in 2017 alone including a substantial increase from emerging markets. Mattar places a huge emphasis on developing a comprehensive sustainable tourism master plan that will serve as a main contributor to the Ras Al Khaimah economy in the years to come. Mattar is also spearheading RAKTDA new destination strategy for 2019-2021 that aims to sustainably grow the destination to attract three million visitors by 2025.